I get a lot of PMP Exam related questions, which are essentially the same. Some are posted on the PMCHAMP Online PMP Forum, and others are emailed to me, or asked in my PMP BOOT CAMP trainings in Singapore, Dubai or elsewhere. The PMBOK Guide Sixth edition is out.. So, if we are planning to take PMP exam, do I have to refer to PMBOK Sixth edition only? Can you please advise. Yes, the PMP exam is now based on the PMBOK Guide Sixth edition since July 2013. There are now more processes – 47 in total, and the number of knowledge areas has increased to 10 also. You must make sure you are using the latest edition of the PMBOK Guide for your PMP exam preparations. Is the actual PMP exam a lot tougher than Rita Mulcahy’s questions? or are the questions near the actual ones? Questions are pretty close to the real exam if you read the Rita’s PMP exam Prep book. 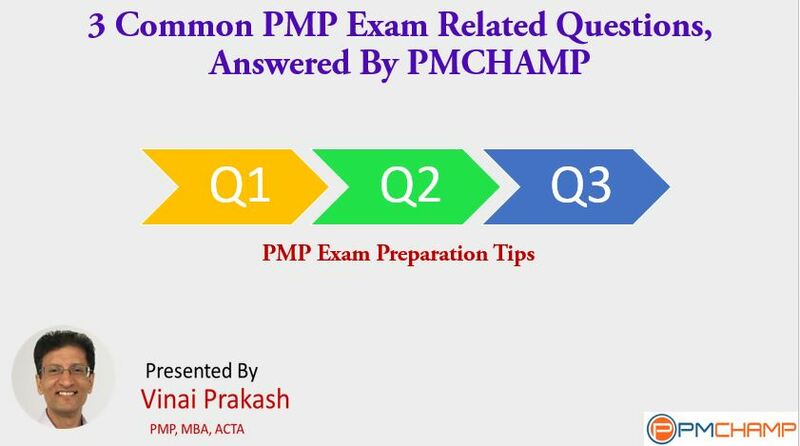 However, the questions in the book have not changed since the past many year, and in the actual PMP exam, there are always new questions. Further, their question bank is so huge that a question never gets repeated. Thus, you need to go beyond the Rita’s questions, and increase your knowledge base, and practice base. After you’ve done this, you can practice on the hundreds of mock test available. Check out our PMP Resource Guide. I have failed the PMP Exam in my first attempt – not because of knowledge deficiency but because of poor reading and reaction efficiency. Do you have any solution for me. In exam I could solved only 155 later I mark with blank ahead. But I don’t know why I got 4 Below Proficient and 1Moderately Proficient. Do not despair… But it is pretty clear that your reading speed is your bottleneck. If you leave over 20% questions in the PMP exam, it is very difficult to pass. Questions in the PMP Exam are distributed over the 5 Process Groups, and the PM Framework, and there is a fixed % distribution for the questions. Refer to the PMP Exam Question Distribution after changes. One of the first things I would recommend is to practice with timed questions, where you give yourself only 60 seconds to complete each question – irrespective of its length. At First, it will be tough… but if you stick to it, slowly, over the next 10 days, you will begin to speed read, and be able to comprehend and answer the question correctly in this rapid fire round. Once this hurdle is overcome, then you can focus on building your knowledge base. As you know, only experience is not enough. What you need is a solid understanding of the Concepts as given in the PMBOK guide, Fifth Edition. Do more mock tests after you can answer about the ITTOs for any process, you know the logical flow of the sequence used during the planning processes, and can tell it forward and backwards. This will surely help. Do you have other PMP Exam related Questions? Just post them here as Comments, or on the PMP Forum, and I’ll get back to you shortly. Don’t let anything come in your way to the PMP Certification. We are glad to inform you that we have completed THREE FULL YEARS for the PMP COACHING program at PMCHAMP, and over 1,680 students have completed and passed the PMP Exam with our coaching. We’ve collected hoardes of accolades and testimonials for this coaching. This would not be possible without your continuous support, feedback and encouragement on my PMChamp Blog. I thank you all for this. To celebrate this occasion, we are giving generous discounts on our PMP Coaching Workshop too. Click here to check out and avail of this fantastic offer, which is valid for a short time only!